Goldie J. Mueller, 88, Algoma, died Tuesday, July 24, 2018 at the Skilled Nursing Facility in Sturgeon Bay. 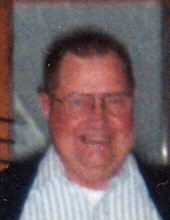 He was born March 23, 1930 in the Town of Clay Banks to Andrew and Alvina (Luedtke) Mueller. Goldie married Corrine Vertz at the Moravian Church in Sturgeon Bay on June 28, 1952. Goldie entered the US Army and served during the Korean Conflict from 1952 to 1954, where he was honorably discharged. He worked at the Algoma Hardwoods for over 40 years. The couple had a dairy farm and raised pigs for about 10 years. Then they started raising Belgian Horses. Goldie would have them in all the local parades and would enter them into many horse pulls. He was a member of the Barefoot Horse Pullers and the Frontier Farmers Assoc. He also love to Polka Dance, ride around in his mule and visit with all the neighbors. Goldie is survived by his wife of 66 years, Corrine, three sisters-in-law Betty Mueller, Carole Mueller and Helen Mueller; many nieces and nephews. He was preceded in death by his parents, eight brothers and one sisters-in-law Wilbur (Lorraine), Orville, Orlan, Robert, and four infant brothers; his in-laws Harry (Ella) Vertz; four brothers-in-law and three sisters-in-law Geraldine (Roland) Stichmann, Ronald (Delores) Vertz, Roland Vertz, and Orville (Nancy) Vertz; and two nephews Gary and Greg Stichmann. Family and friends may gather at St. Peter's Lutheran Church, Forestville, Saturday, July 28, 2018 from 9 AM until the time of services at 11 AM with Rev. Dr. Christopher Jackson officiating. Burial in the church cemetery with Full Military Rites. The Corrine would like to thank Dr. Kelton Reitz, Unity Hospice, Tom and Kathy Mueller and Terry and Marijo Mueller for all the care and kindness given to Goldie. The SCHINDERLE FUNERAL HOME, Algoma assisted the family with arrangements. Send your online condolences to our Tribute Wall at www.schinderle.com. To send flowers or a remembrance gift to the family of Goldie J. Mueller, please visit our Tribute Store. "Email Address" would like to share the life celebration of Goldie J. Mueller. Click on the "link" to go to share a favorite memory or leave a condolence message for the family.